Think for the Future is a local non-profit organisation aiming to educate Nottingham’s young people about sensitive topics, including the criminal justice system and the dangers of sexual exploitation, through first hand true experiences. We recognise that by having sessions delivered to classes by individuals who have been to prison or have been groomed, then the sessions immediately are more effective as the students become engaged with the content and take away a great deal. We strive to deliver sessions that have a deep impact on the audience and help to prevent young people from making decisions that will reduce the quality of their future, and instead learn from the speakers. We are needed because Ofsted's 2013 Report on PSHE highlights glaring flaws in the approach many secondary schools take to the subject..
To view their website click here! 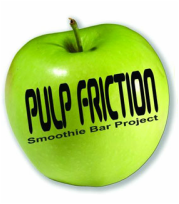 The Pulp Friction Smoothie Bar project provides opportunities for young adults with learning disabilities to develop work-readiness as well as social and independence skills. This happens by taking our smoothie bikes to different community events and all our young people work at their own pace to their own strengths in a fun, friendly and supportive environment.This Project recruits people with and without learning disabilities to work alongside each other and learn together. Volunteers earn “training points” each time they volunteer with us and this entitles them to free training in Basic Food Hygiene, First Aid and Customer Service training. Volunteers can also access further training through Nottinghamshire Clubs for Young People to whom we are affiliated. To view the website click here! ﻿﻿Under Empower Malawi we are working with a rural village in Malawi where we have developed a solar powered fishing light which can be used as an extremely cheap source of light which they can replace with their current expensive paraffin powered fishing lights. This product is the first introduced to the market significantly reducing the fisherman’s costs, wherein they spend over £5 per night, therefore increasing their profits, creating a better standard of living for the community. Lake Malawi where we are running the project, like most African giant Lakes, is significantly over fished. In the past 10 years the lakes fish stocks have reduced by 90% putting three countries who rely on the Lake at high risk of losing their main industry and causing a large population of people to fall deeper into poverty. On top of this 70% of animal consumption, is currently from fish in Malawi, creating a huge reliance on the Lake for protein, something that could have vanished in the near future. However our fishing light allows for a financial incentive to be created as the community can catch less fish however still receive over double the amount of profit due to the significant reduction in the cost for the light. Therefore by putting a time cap on the usage of the light will reduce the amount they catch, yet still increase their income. To be a certified EmPower Malawi light renter the fisherman will be trained and given the tools to become Chicken Coup Entrepreneurs removing their reliance on fish from the Lake and providing families with an alternative industry and source of protein. Other aspects of the scheme include a net and lamp exchange. The nets that they use at the moment are mosquito nets which trap the young fish, which has a large negative effect to the fish stocks in the Lake. Therefore we are introducing a net exchange as part of being a certified Empower Malawi light renter, which entails them giving us their nets in exchange to more environmentally friendly nets. We will then repair the nets and sell them onto local tailors, to turn into school bags, ensuring the sustainability of the scheme. We will also be purchasing their old lamps off of them and selling the metal on, which ensures that they are not using paraffin on the side of our light. These two initiatives will ensure that they are reducing the amount of fish they catch, therefore helping to increase fish stocks. In addition to this we are providing a microloan to the fishermen, for them to purchase chicken which they can then sell on for eggs. This will provide them with an additional income, and move the reliance away from fish onto the eggs, as a supplementary source of protein to their diets. Our prototype has been trialled in Ruarwe a large village in Malawi last summer and was received extremely well by the community as well as local organisations. We are implementing the scheme by April in Ruarwe which covers 78 fishermen on this section of the Lake, and once this been completed we are scaling the model across the whole Lake with the help from government input as well as NGO’s across the whole region. This will provide a sustainable and tangible solution to both poverty and overfishing, transforming a large population’s way of living around Lake Malawi. Our partner NGO we met called this project a 'game changer' for rural Malawi and is contacting the Malawian government to make them aware of the scheme.